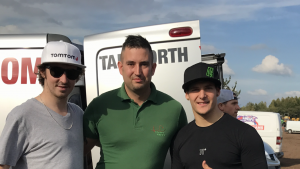 Star Struck - Independent Ambulance Service | Event Medical Cover | County Medics Ltd.
Whilst covering an event today our Operations Director Nick Tuckwell had the privilege of meeting 2 World Champions. He stated that Danny Hart (Down Hill bike legend) and James Rispoli (Super Bikes Legend) were both riding at an event that we were providing medical cover for. Nick went on to say that they were both very friendly people that looked very skilled out on the track and they even agreed to having a picture taken with him. The event went problem free and thankfully no medical intervention was needed, we wish both Danny and James safe riding for all their future races.